It's My Father's Birthday today. December 29th 2008. I'm sure everyone is having a great time. They planned to go to spend the celebration at the beach they are planning to buy. Hay... another family gathering that surely I'll be missing. To think how much fun they have and the BEACH... it's almost 5 months since the last time I get a glimpse of the Ocean. May you have a WONDERFUL BIRTHDAY celebration with the people who love and surrounds you during your very special day. 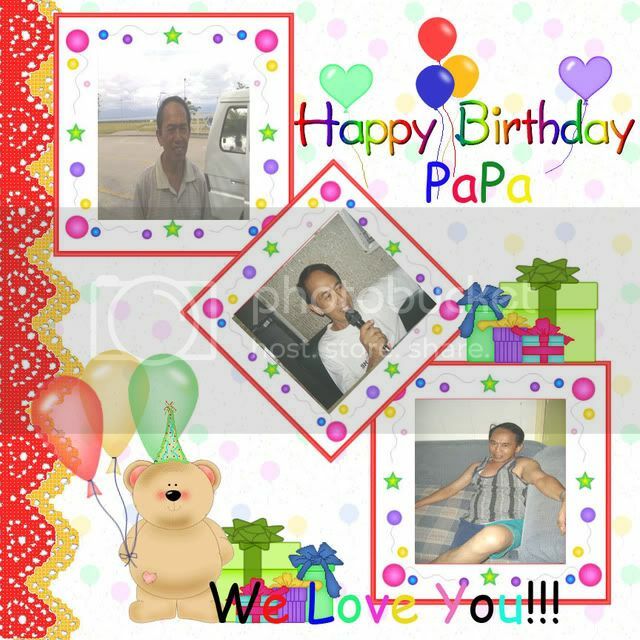 Nova happy Birthday sa imong Papa, I know miss na keyo nimo sila. belated happy birthday to your, papa sis. now lang jud ko ka visit kay super busy sa gatherings oi. Happy Birthday to your dad Nova. You had a wonderful toast to him, your post is so special, hope he reads this too. send my belated birthday greetings to your papa, Novs! people like them deserved to have a wonderful day!